Studies have shown that a simple treatment called lipid emulsion therapy—fatty acids administered intravenously—can heal damage to the heart after a heart attack or cardiac arrest. But researchers haven't understood exactly how the treatment works or whether there are more effective ways to repair the heart. 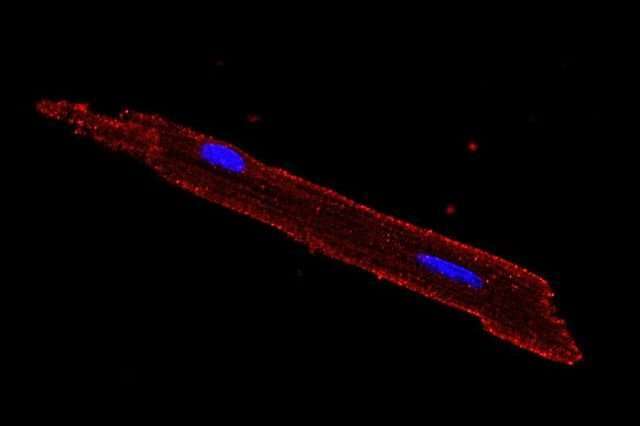 Now, UCLA researchers have identified for the first time a receptor in the cell membranes of the heart that plays a key role in repairing damage caused by heart attack and cardiac arrest. The discovery of the receptor, in mouse and rat hearts, explains the mechanisms behind the protective effects of lipid emulsion and could improve treatments for humans with heart disease. Scientists have known that free fatty acid receptor-1, known as FFAR-1, is present in the human pancreas and brain, but it wasn't known to be present in the heart. This study, published in April in the journal Anesthesiology, confirmed the presence of the receptor in rodent hearts, which are similar in composition to human hearts. "This study clues us in to how we might be able to better help patients heal when they experience heart conditions," said Dr. Soban Umar, first author of the study and an assistant professor in residence in the department of anesthesiology and perioperative medicine at the David Geffen School of Medicine at UCLA. "For the first time, we're finding a particular receptor in the heart that could unlock new pathways for treatment." Using a laboratory method known as "western blot" to detect certain proteins in tissue, the researchers identified the presence of FFAR-1 in the heart. This technique, along with the direct microscopic examination of stained heart muscle cells, confirmed the presence of the receptor in rodent hearts. The researchers then conducted experiments in two animal models to determine the protective and reparative effects of the receptor. Mice and rats in which the receptor was not blocked experienced the repair of heart damage in response to lipid emulsion, while those in which the receptor was blocked did not experience such repair. These findings demonstrated that FFAR-1 was responsible for lipid emulsion's reparative effects on the heart. "Heart attack and cardiac arrest are fatal if not treated promptly," Umar said. "What we found in rats and mice is that activating FFAR-1 is pivotal in effective treatment of these conditions." Lipid emulsion is federally approved for treatment of an overdose of local anesthetic drugs and as a source for intravenous nutrition. "Down the line, we may be able to target the FFAR-1 receptor to make newer drugs to treat heart disease without being limited to administering lipid emulsion intravenously," Umar said. "Perhaps we can selectively activate the receptor in the heart to prevent people from the deadly consequences of these heart conditions." Mansoureh Eghbali, associate professor in the department of anesthesiology and perioperative medicine at the David Geffen School of Medicine at UCLA, led the study.